The excellent weather of the summer has fallen off the cliff and it’s all freezing cold mornings and thick winter coats. I caught a glimpse of myself in the mirror after a bath yesterday and momentarily thought the house was haunted, such was the ghostly shade of white. My top beauty tip for this time of year is fake tan from top to toe. Resist the temptation to put yourself into hibernation along with the hedgehogs. Tanned skin looks healthier, and more toned, thus by-passing the whole ‘must go to the gym’ ethos. (If you do feel like going to the gym, having a bit of colour is a spur to put on a t-shirt/ leggings combo). I’m not recommending going the full TOWIE. Don’t turn yourself orange, which I’ve done on many an occasion, and glowed brightly in the dull grey light of a school morning like a human pumpkin. I’ve always been a fan of coloured mousses, which allow you to see where errors may occur, as well as gradual moisturising tans where errors only appear as faint shadows, but it’s only recently that I’ve embraced the concept of the tanning mitt – which allows you to rub in thoroughly without the shame of brown fingers. 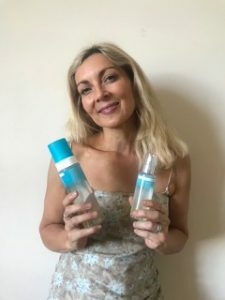 At the end of last year I came across the genius concept which is the tanning roller, a sponge roller with a handle, and The St Tropez Purity Range was this summer’s big winner for me, being both fail safe and fresh smelling. Once brown, you’ll be brimming with self love and admiration*. Glow forth.